Caught a subtle thing in one of the SkyTools 3 videos. 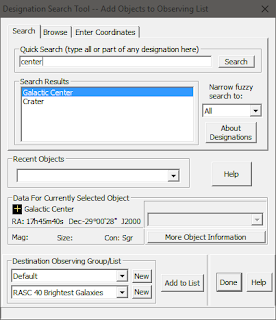 A keyword "zenith" was entered into the Designation Search Tool box. I didn't know you could do that! I tried it and a few others. Read the help page to confirm the feature. Wow. Neat. 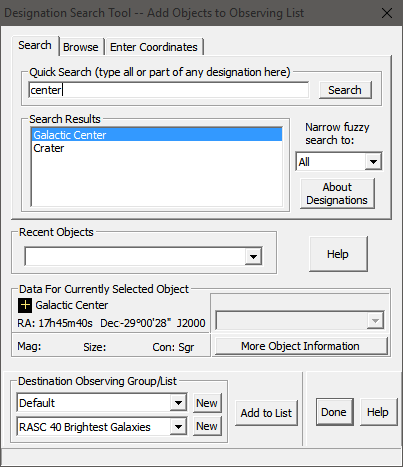 I documented them over on the companion site, in the SkyTools resources section. Reminds me of when I was trying to help Iosif with finding the centre of the galaxy... Would have been handy, knowing the keyword then.